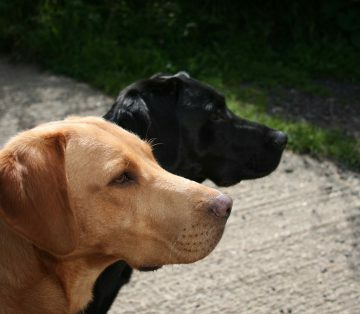 As I take the boys for their early morning walk I can see that it is going to be a corking day. We are about to reap the rewards of that stunning red sky last night. 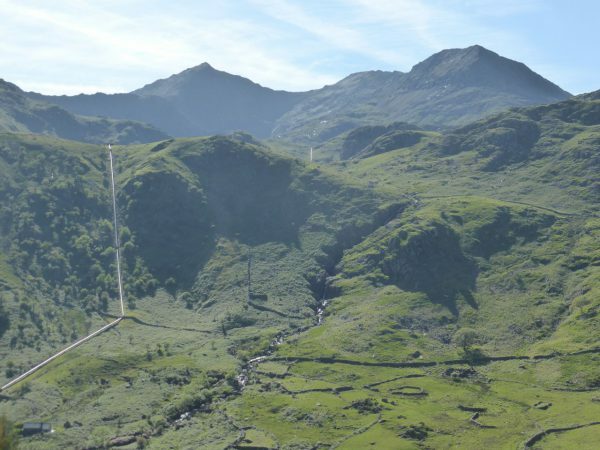 I have been considering a trip up Snowdon, a walk, not a ride on a train. But I think I need to have a look at it first. It’s not the climb of 3,500 feet or the distance that is the issue it is my frustrating inability to walk next to precipitous drops, or for that matter any steep drop. 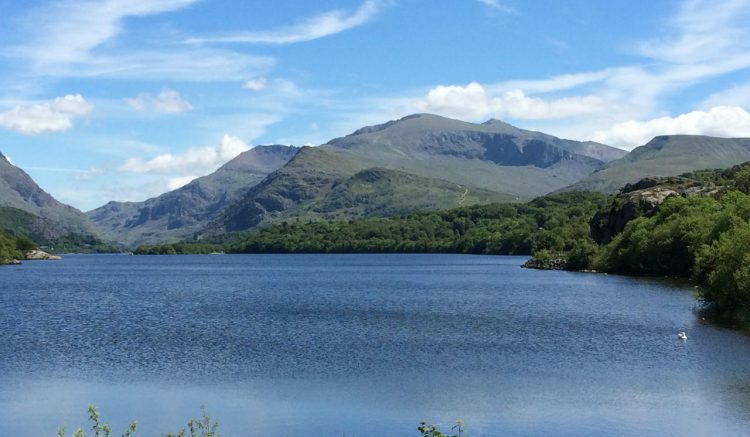 This is not the trip for a walk to the summit of the highest mountain in Wales, but by looking I can decide if it should be added to next year’s agenda. 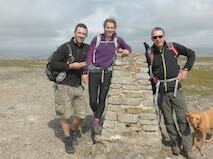 Last year when I was planning our grand tour I picked up a walking book covering North Wales. Blog followers will know that we are not fans of walking books, much preferring the freestyle approach of walking by looking at a map and heading off with a plan that might change whilst we are on route. However, today we choose a walk featured in our book. 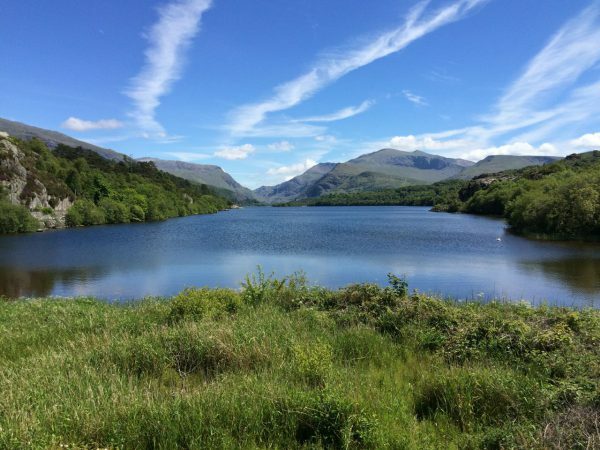 We have a pleasant drive to Llanberis. On arrival we realise that this is a busy spot, it feels very touristy but I am confident that within a short distance we will have the place to ourselves. 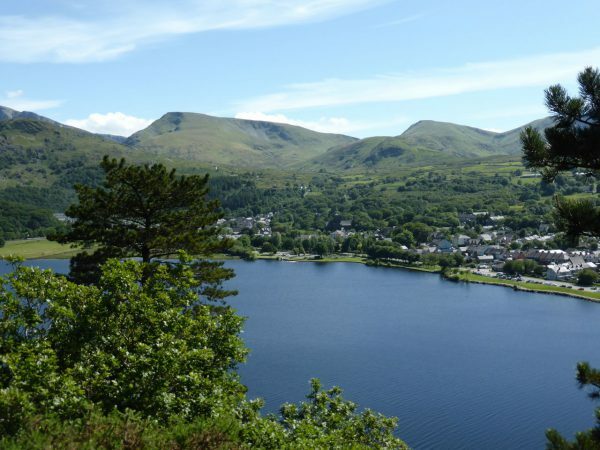 We start near the Llanberis Lake Railway, which runs along the north side of the lake we propose to walk around. 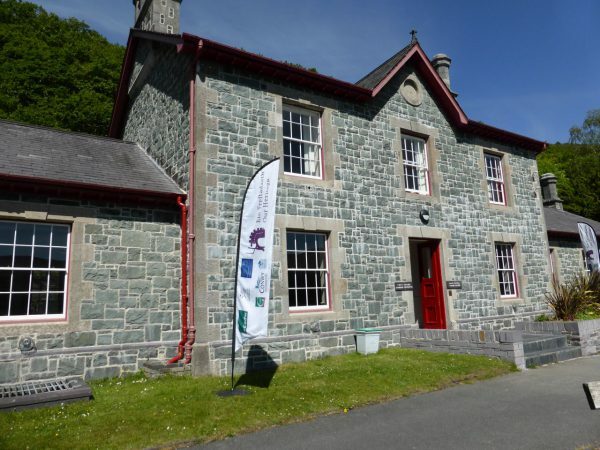 Soon after we walk past Electric Mountain, this is a popular spot providing an opportunity to tour Dinorwig Hydro Power Station. It looks interesting, but it’s not a place we can easily visit with the dogs and in any case there is some walking to be clocked up. 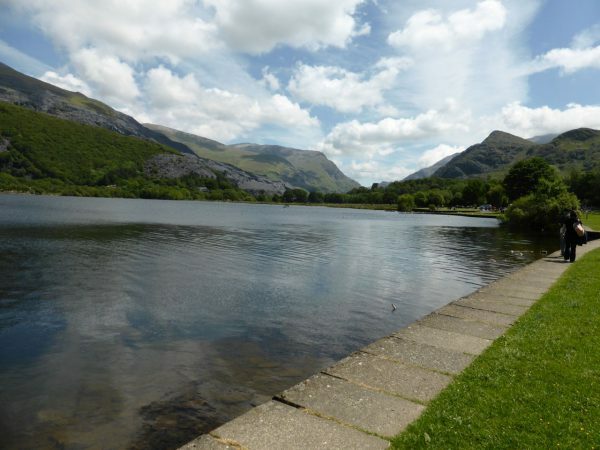 The start of the walk is very easy skirting the edge of the lake, Llyn Padarn. 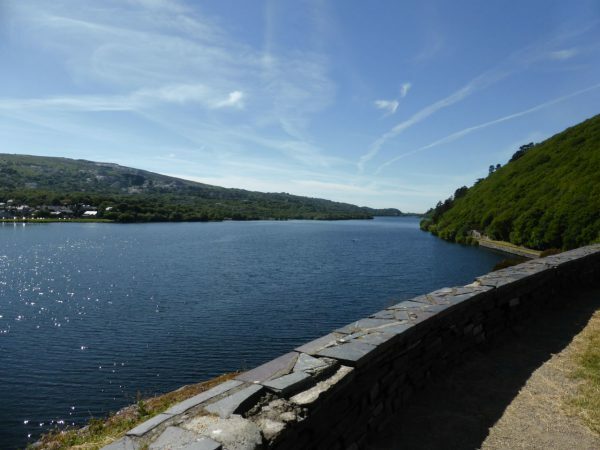 For the first mile or so there are plenty of folk about, after leaving Padarn Country Park we pick up the bed of a former railway that ran along side the south side the lake. 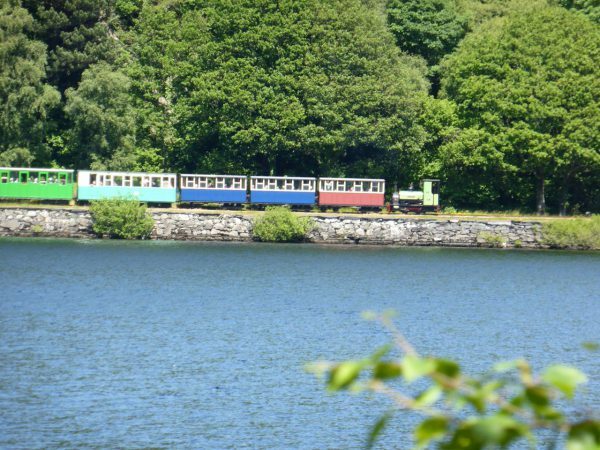 On the other side of the lake we get glimpses of the steam railway running trips for tourists. 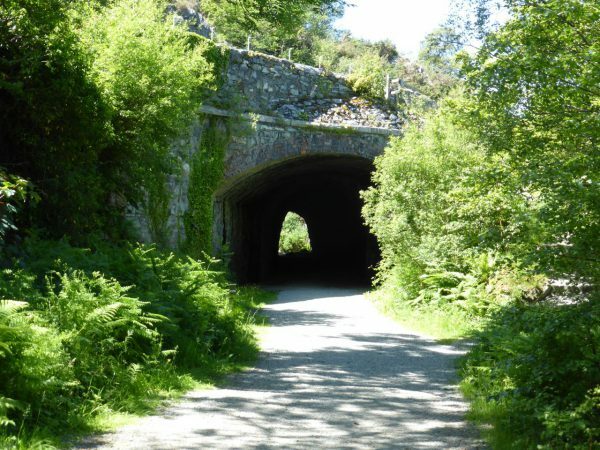 We go through a short tunnel and keep straight ahead along a path until we reach the main road. After crossing the road we turn right to walk back to a kissing gate leading to the, now disused, old A4086. There are signs of recent bear activity, but they must be lurking in the rocks because we can’t spot them. We do see a plaque and information board explaining the historic significance of this rocky outcrop. 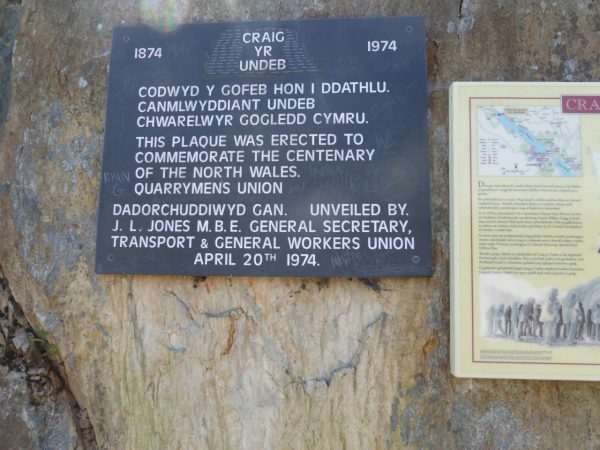 It records that in the 1870’s 110 quarrymen from Glyn Rhonwy Quarry declared they were union members. 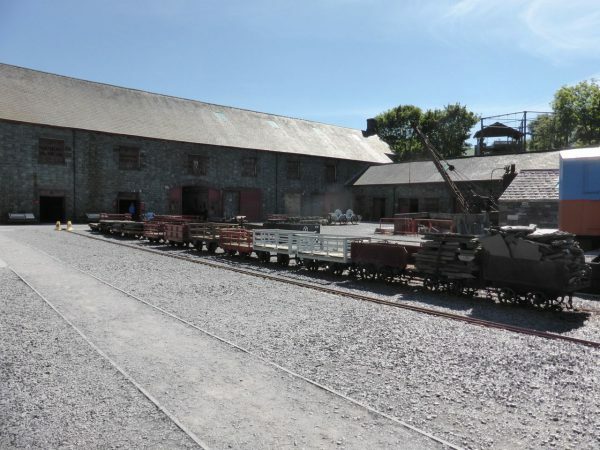 As a result they were locked out of the quarry by the owner Captain Wallace Craig, who soon realised that a closed quarry earns no money and the men returned. In an attempt to stop the spread of trade unions other quarry owners banned union meetings on their land. However, Lord Newborough, owner of this rocky outcrop, allowed the men to use the spot for their Union Meetings. The outcrop is known as Craig yr Undeb (Union Rock). We follow the road to a junction and fork right to cross an old bridge. 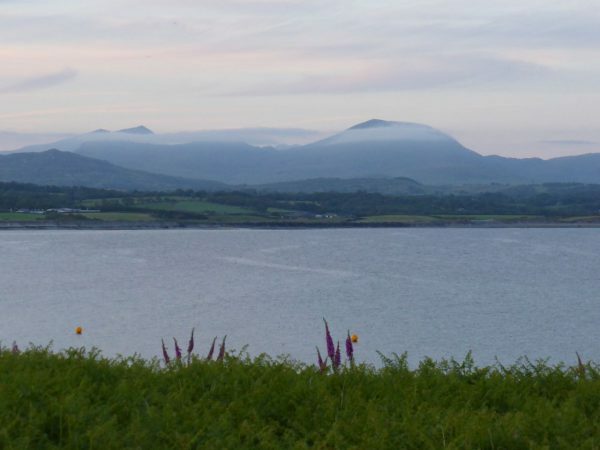 This is a cracking spot with stunning views of the lake with Snowden looming in the distance. The perfect spot to sit and have our picnic. Refreshed it is time to head on following the lane around the side of the lake signposted to Fachwen, this lane climbs steadily up through the woods for about a mile. Just past an old telephone box we turn right at a footpath sign and follow a path down to a tarmac drive. 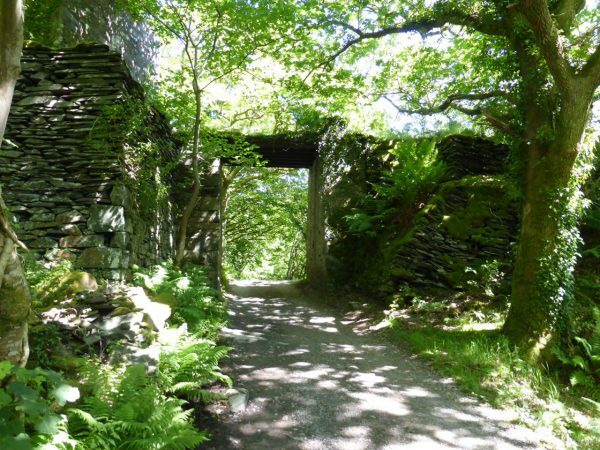 We walk down the drive passing some very remote cottages and go under an old quarry bridge. The path narrows and crosses a footbridge over a stream, we then turn right and soon left through a kissing gate before heading uphill again. This is the sort of uphill path that requires steps and when we reach the top there is a stunning viewpoint looking over the lake. As the path descends we see more signs of the remains of old quarry buldings including a multi-seated toilet. 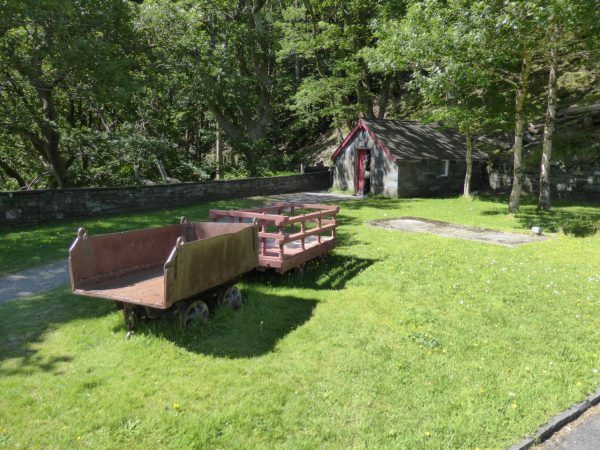 Once into the grounds of Dinorwic Quarry Hospital we see the small mortuary sited in a corner. A reminder that quarrying was a very hazardous industry. 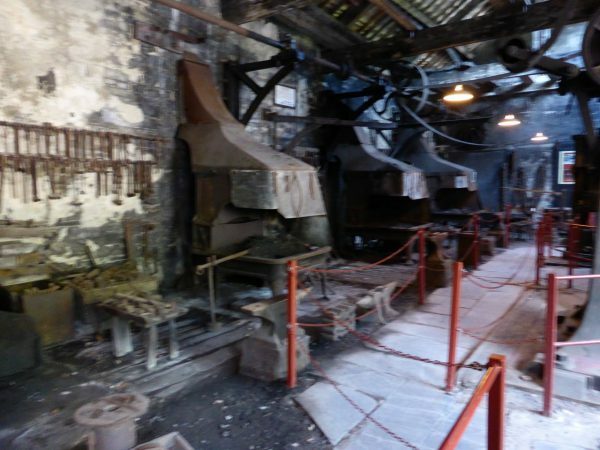 It is late afternoon, but there is still just time for us to visit the old Dinorwic Quarry Hospital. In 1835 the quarry workers formed a Friendly Society, which for an annual fee provided financial help in times of need. By the 1860’s it had over 400 members and was able to cover the cost of a doctor’s visit or hospital admission. The quarry owners built the hospital but the workers paid for its running costs. The information in the hospital was both fascinating and horrific. Quarry work was harsh and broken limbs were common, a combination of the cold and shock could prove fatal especially as this was prior to the discovery of antibiotics. The quarry men were trained in first aid and getting the injured quickly to medical care was essential. X-Rays were used here in 1897, just a year after their first use in Germany. The hospital now houses many artifacts and is a stark reminder of how medical services used to be delivered. A tour around the hospital deserves more time than we have available, but we certainly hope to make a return visit. Stopping briefly to admire the views over the lake from the gardens made for the enjoyment of convalescing patients we follow the path down to the lakeside and soon reach the car park of the National Slate Museum. We decide to take a look, wandering in we are warned that it is last entries for the day and that it will close shortly. Now this is a place that cannot be rushed, there are truly so many interesting things to see. We realise that we cannot do it justice so we take a very quick glance at some of the displays, agreeing again that we need to return when we have sufficient time. This must have been an extremely noisy, dirty place to have worked, but one where everyone worked together. One of the many things that impressed me was the machine room, apparently when a new machine was purchased it was immediately dismantled and spare parts made to ensure that in the event of a breakdown it could be quickly fixed. When we were in the Presili Hills last year we walked past Rosebush Slate Quarry. 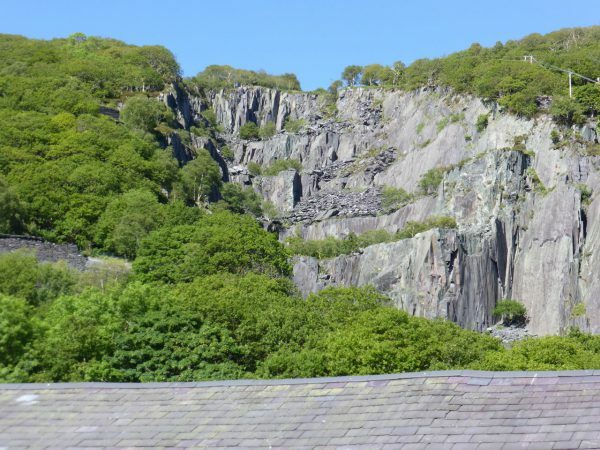 I thought that was large until I visited Llanberis, the quarries here are immense and all around the hill sides are marked with quarry tracks. We take the short stroll back to our car and decide to take a route around the other side of Snowden to get back Chwilog. On the way we park at a viewpoint with stunning views over Snowden, only spoilt by the pipeline scarring the landscape as it runs down from Llyn Llydaw Reservoir. Back at Swn Y Mor it is yet another cracking evening, so once again we take an after dinner wander down to the beach. This is quickly becoming a favourite spot for the dogs. 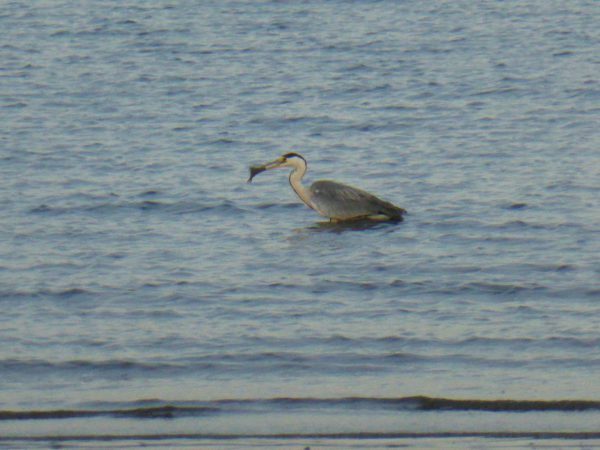 We see a heron catching his supper and then walk to Pen-ychain headland to enjoy the sunset whilst keeping an eye out for the Bottle Nosed Dolphins. It is another red sky tonight so with a bit of luck we are in for another stunning day tomorrow.